Anne Justis was born in 1730 in Kingsessing, Pennsylvania, a neighborhood in the southwestern section of Philadelphia. She was the daughter of Morton Justis and Brita Walraven Justis, Swedish immigrants. John Morton was born in 1724 in Chester County, Pennsylvania, on a farm in Ridley Township. They were neighbors in the farmland of Delaware County, Pennsylvania, both of Swedish extraction, whose ancestors immigrated to the lower counties of Pennsylvania at the opening of the eighteenth century. John’s father died a few months before his birth. When John was about seven years old, his mother his mother married an Englishman, John Sketchley. His stepfather was an intelligent and gifted man, who gave John a good basic education at home. Sketchley also trained John in the professions of farming and surveying, a useful trade that Morton would practice for the rest of his life. 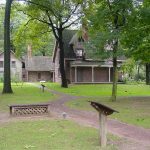 When Anne Justis married John Morton in 1745, she probably had little idea of the honors the future held in store for her husband, even though he was already looked upon in their small community as a young man with a promising future. John was noted for his abilities and his habit of hard work. As a young man, he cultivated his own acreage, and alternated his farm work with surveying new lands. His integrity and his commitment to the community made him popular with the citizens. The family continued to reside in Ridley, where John was active in civic and church affairs. Anne and John had twelve children, nine of whom survived into adulthood, three sons and six daughters: Aaron, the eldest child; Sketchley, a major in the Continental Army; Rebecca; John, who became a surgeon and died while a prisoner of war on the British ship Falmouth in New York Harbor; Sarah; Lydia; Elizabeth; Mary; and Ann, whose husband, Captain John Davis fought in the Revolutionary War as an officer in the Pennsylvania militia. In 1754, at the age of thirty, John Morton turned his attention to politics. He was elected to the Pennsylvania General Assembly in 1756, and for some time was the Speaker of the House of Representatives. He sided with the Penn family proprietorship, and served on that body for eighteen terms, while also serving as a Chester County Justice of the Peace (1757-64 and 1770-74) and as a local sheriff (1766-69). Despite his lack of formal training, John served as an associate Justice of Pennsylvania’s Superior Court. Morton’s service to the nation began in 1765 when he represented Pennsylvania in the Stamp Act Congress in New York. What gave the delegates the most trouble was whether to acknowledge the authority of Parliament to regulate trade. If they admitted that Parliament had the authority to regulate trade, it could be construed as an admission that taxes on the American colonies to raise revenue was acceptable. The delegates maintained that Parliament could not levy taxes on the colonies, since the colonies had no representation there. In 1774, Morton was elected to the Continental Congress that met on September 5, 1774, at Carpenter’s Hall in Philadelphia, and was re-elected in 1775 and again in 1776. Morton’s constituents in the Pennsylvania colony were sharply divided over the independence issue, and it looked as if they might favor ties with Britain, and not the independence that the other colonies were striving for. Although Philadelphia was only 14 miles from his farm in Ridley Township, it required at least half a day for Morton to make the trip to the Congress, thus adding to his many burdens. Serving on so many colonial and then national committees, Morton had to spend many days and weeks away from home. During all these years, Anne was caring for their estate and raising their nine children. By the time the Second Continental Congress met May 10, 1775, fighting in the Revolutionary War had begun. Moderates in the Congress still hoped that the colonies could be reconciled with Great Britain, but a movement towards independence steadily gained ground. We are really preparing for the worst that can happen, viz, a civil war. I hope Time will manifest to the World that a steady Perseverance in the Cause of Freedom will triumph over all the deep laid Schemes of Tyranny, and that Britain and America will again be united on the solid Foundation of Commerce and the Constitution. You have declared the New England People Rebels, and the other Provinces Aiders and Abettors, this is putting the Halter about our Necks, and we may as well die by the Sword as be hanged like Rebels, this has made the People desperate. I sincerely wish a Reconciliation, the Contest is horrid, Parents against Children, and Children against Parents. The longer the wound is left in the present state the worse it will be to heal at last. Some have suggested that the last sentence indicates a lack of support for independence, but many of the signers of the Declaration of Independence harbored the same fears, and civil war did break out in many of the colonies during the Revolutionary War. 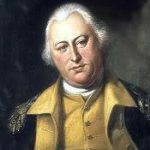 In June 1776, when the Congress began the debate on a resolution of independence, the nine men Pennsylvania sent to Congress were bitterly divided over the issue of independence. Some naysayers felt it was too soon to press for independence, and insisted that the Congress should resign itself to diplomacy and reconciliation with Parliament. At the other end of the spectrum was Benjamin Franklin, who had renounced all allegiance to the king and was ready for independence. In an informal vote on July 1, Pennsylvania was solidly against independence. Several Pennsylvania delegates were leaning toward nay, with only Franklin and his friend, Judge James Wilson, solidly in favor of the resolution. Morton had changed his personal position in favor of independence that spring, after England refused to consider efforts that would allow the colonies greater autonomy, but the citizens he represented were against it. The final vote was to be taken on July 2, 1776. As the story goes, Morton arrived late at that decisive meeting, and found himself in a delicate situation. The delegates from Pennsylvania were equally divided between independence and continued allegiance to England, and it fell to John Morton to give the deciding vote. In the spirit of true patriotism, John Morton followed the course of his own convictions, and cast his vote in favor of the liberty of his country. His most dramatic act as Delegate to the Continental Congress was his crucial switch to the side of Benjamin Franklin and James Wilson in the vote for the independence of Pennsylvania and the other American colonies. Those who called for independence were keenly aware of the treasonous nature of their actions. Back home in his district, John Morton was unpopular because of what he had done. As a result of his vote for independence, friends, neighbors, and even relatives turned against him, and was abandoned by those whose political sentiments differed from his own. A sensitive man, he was deeply affected by his ostracism. Yet, John Morton returned to Philadelphia on August 2 to affix his signature to the Declaration of Independence with most of the other delegates. In Congress in 1777, Morton assisted in organizing a system of confederation, and was chairman of the committee which adopted the Articles of Confederation, but he did not live to see it ratified, nor to witness the change in public sentiment in support the cause of American Independence from Great Britain. John Morton was a truly good man. He was kind to the poor; and to his family, he was an affectionate husband and father. His only enemies were those who would not forgive him because of his vote in favor of independence. Tell them they will live to see the hour when they shall acknowledge my signing of the Declaration of Independence to have been the most glorious service that I ever rendered my country. John Morton passed away quietly on April 1, 1777, on his Ridley farm at the age of fifty-three. He was the first of the fifty-six Signers to die. Unfortunately, he did not live to see the outcome of the American Revolution, nor the results of his hard work. In September 1777, after the Battle of Brandywine, the British Army were passing through the countryside, and damaged the Morton property. Anne had to flee across the Delaware River with what valuables she could take to Billingsport, New Jersey. Many of John Morton’s papers were destroyed, which could have broadened our understanding of John Morton’s private and public life. 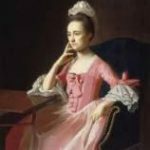 In November 18, 1782, as the war was nearing an end, Anne Morton filed an accounting of the losses she had suffered, in compliance with an act of the General Assembly. Anne Justis Morton died sometime after 1800. John and Anne Morton were members of St. Paul’s Church in the town of Chester, Pennsylvania, and their remains are said to be interred in the old churchyard. 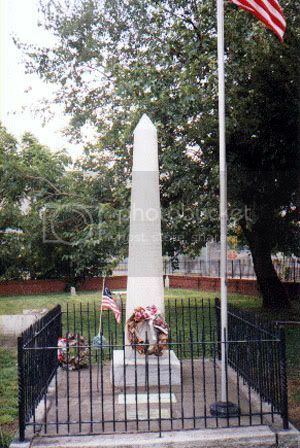 On July 5, 2004, in recognition of John Morton’s role in signing the Declaration of Independence a plaque was placed at his gravesite by the Descendants of the Signers of the Declaration of Independence. He was the first of the fifty-six signers to receive this honor.